It took me a long time to use this cuticle oil. I finally took out this oil to pamper myself with a home manicure. This oil was going to be the last step. I love that it comes with an eyedropper and brush so that you can choose how you want to apply. I picked the eye dropper. 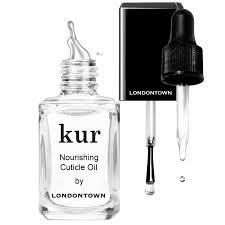 Less is more with the Kur Cuticle Oil. On my first nail, I applied two drops and it was way too much. For the rest of my nails I barely applied one whole drop and it was enough. It has a bit of a gel consistency that is thicker than most nail oils. At first, I wasn’t sure about it, but by the end of all of my fingers, I really liked it. It was thick enough that it felt like it was really moisturizing, but still a light oil based liquid that didn’t leave anything feeling sticky. It doesn’t even really leave my fingers feeling oily like most. I could see the difference in my cuticles almost instantly. I am excited to see what will happen after daily usage.